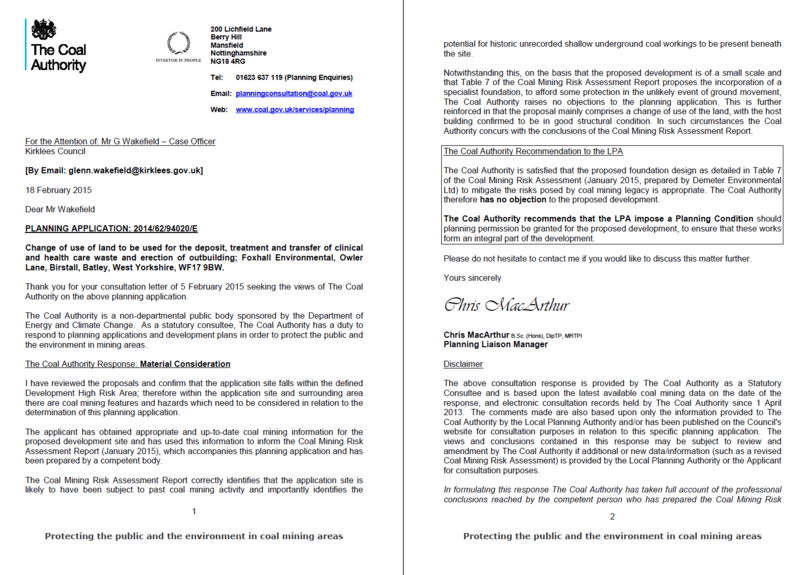 Given that the subject site was within a ‘Development High Risk’ Area’ the Coal Authority objected to the application until a Coal Mining Risk Assessment was prepared for the site to assess the risks posed by the legacy of coal mining in the area. Large and small scale geological maps confirmed the bedrock comprised of Lower Pennine Coal Measures and that the Flockton Thin Coal (FN) seam appears to outcrop on the southern boundary of the site. The seam thickness was recorded to be between 0.3 to 1.4m thick. BGS boreholes indicated that weathered coal was present in close proximity to he surface in the area of the site. The recommendations of the report were accepted (the memo can be accessed here) and the objection to the application lifted.